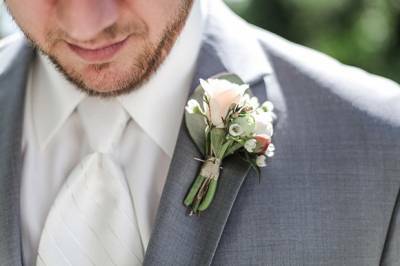 We attended a very good friends wedding this past weekend� the first one since I've been running the blog/magazine, and aside from it being a wonderful celebration it was fascinating to look at the other side of a wedding! My good friend FIONA captured the day and I followed her around a little (trying to keep my editors opinion to myself!!) whilst taking the bridal party portraits. I tell ya, it gave me a far greater appreciation for just how difficult a job wedding photographers have. For one it's a heck of a long day� and you're on your feet for all of it! And secondly, dang it can be hard to work within the constraints of the weather!! New Zealand's harsh sunlight made getting the portraits so difficult, but it's so hard to balance that timing when all you want to do is go and celebrate with your guests by the light is a little more softer! It's also such a talent to be able to capture reception details and do them justice when you're dealing with an inside reception venue that has not so desirable wallpaper or general background �noise'. So yeh it was an interesting insight� but I have no doubt that Fiona will have totally rocked it� oh and have I mentioned the insane floral wall that LEAF & HONEY created? Amazing!! TELL US ABOUT YOUR PROPOSAL: Dan had a romantic New Year's Eve proposal all planned. Unfortunately I woke up horribly sick. In an effort to not ruin our New Year's plans I attempted to at least make it to midnight. Well, I made it to about 10 pm where we ended up on the couch, in our PJ's. In the days following, Dan tried to find the perfect time to pop the question. When I had finally recovered from being sick, Dan suggested we have a New Year's Eve re-do. I thought this was a cute idea and readily agreed. We went to one of our favorite restaurants for dinner, enjoyed some hot chocolates afterwards, and wandered through downtown Portland appreciating the clear winter night. When we arrived home, chilled but happy, Dan decided that should do a customary "Countdown to Midnight," since we missed it on actually New Years. I laughed and agreed. As we the our count came to "1," he kissed me, dropped to one knee and said, "This is how it was supposed to go: Will you marry me?". Shocked, I had absolutely no idea that he was going to propose then, tears of happiness and excitement were shed as I replied, "Yes." We celebrated with our friends and toasted with champagne in between phone calls to family! 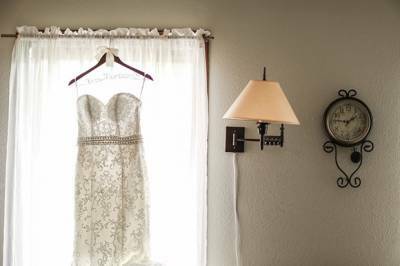 TELL US ABOUT FINDING YOUR WEDDING DRESS: Initially, I wasn't sure if I would find a dress right away. Knowing my taste and tendency to be picky, I thought it might take a couple visits to really narrow down what I wanted. While I knew the goal was something timeless with a bit of a vintage flair, elegant, and a dress that reflected my personality; I also wanted to be able to dance comfortably during the reception-both Dan and I love to dance! Every kind of dress � from mermaid to a ballgown � had flashed through my mind at one point. So I wasn't really sure what I would end up purchasing. The Maggie Sottero dress I chose was actually the first dress I tried on. I put it on and immediately it just felt perfect. I tried on some more options but nothing really stood out to me�not to mention a lot of the dresses were so heavy. As my bridal party debated the styles I had tried on, my dad interrupted and asked the Bridal Consultant to bring the first dress again. As I tried it on for the second time, the feeling of "this is it" came over me. I just felt like it was made just for me. The lace had a vintage feel, but had modern twist to lace. The cut was feminine and timeless--we added the beaded belt to it and the cathedral length veil for a bit of drama. DESCRIBE YOUR WEDDING FLOWERS: My cousin Katie is a stylist and part of the fantastic duo that is Ponderosa and Thyme. So selecting a florist was easy! Getting married in June, I knew I wanted peonies. 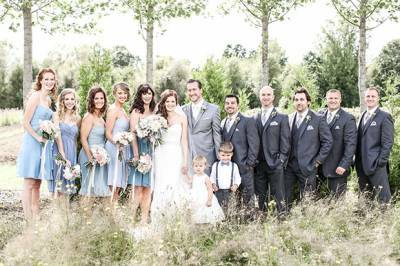 I left the creativity up to them�and they created the most stunning florals! My bouquet was gorgeous and dramatic, yet soft. It included blush peonies, peach garden roses, a mix of pastels and was finished with dusty miller and eucalyptus. They created complimenting bridesmaid bouquets. The centrepieces, and the head table garland featured rich greenery elements and with peonies and garden roses. They carried this over into our wedding cake as well, using peonies/garden roses to recreate a cake I saw on pinterest. FAVOURITE DETAIL OF THE DAY: So hard to choose just one detail, several stand out. The hand written letters of marriage advice from all the influential women in my life, the incorporated family heirlooms, the candy bar featuring our favorite sweets and the sparkler exit to end the amazing celebration. MOST MEMORABLE MOMENT? The ceremony�we both wrote personal and heartfelt vows to each other. It is my absolute favorite moment. We put a lot of energy into creating a thoughtful ceremony that represented who we are as a couple and the marriage we want to have. ANY OTHER DETAILS THAT HELP TELL THE STORY OF YOUR DAY? We tried to incorporate our roots throughout our wedding ceremony and reception. From my Grandma's wedding ring tied in the lace from my Mom's wedding dress on my bouquet, to the collection our family's wedding photos displayed, to Dan's brother building the arch we got married under. This was truly a family affair.